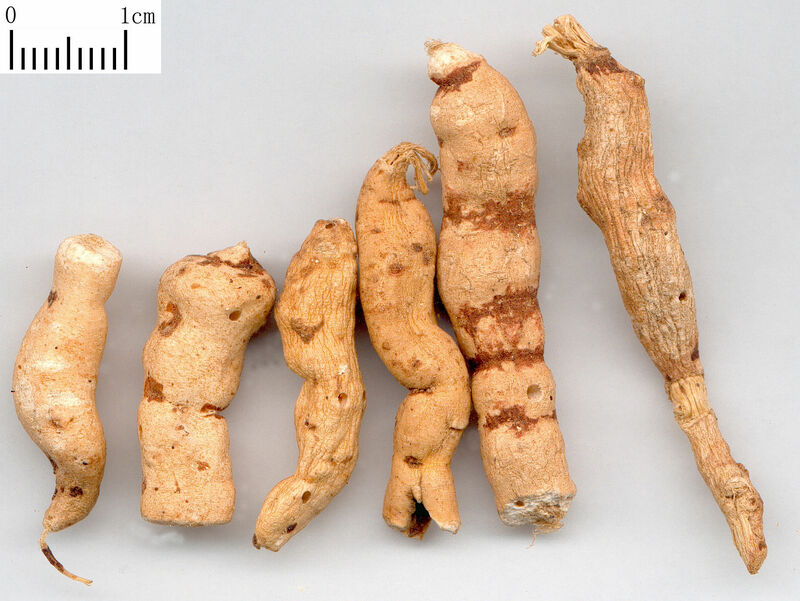 The root tuber of perennial herbaceous plant Euphorbia kansui T. N. Llliou ex T. P. Wang. of family Euphorbiaceae. Mainly in Shanxi, Shaanxi and Hebei provinces, etc. of China. Dug out in early spring before blossom, or late autumn after leaf and stem withered which is viewed as the better. Light smell, slightly sweet and spicy taste. Collected in autumn, full, white, enough mealiness. Bitter, cold; toxic; lung, kidney, and large intestine meridians entered. Being bitter-cold and descending in property with the strong action of expelling water by catharsis, it can result in serious diarrhea to further discharge accumulated water rapidly. It is indicated for edema, tympanites and hydrothorax without deficiency of healthy qi. It can be used singly in powder or combined with Da Ji and Yuan Hua, known as Shi Zao Tang from Shang Han Lun. It has the action of relieving swelling and dissipating nodulation when being used topically. For sores and abscess, the powder of Gan Sui is mixed with water for topical application. 0.5~1g, used in pills or powder. It is not recommended to be used in decoction because its active component doesn't dissolve in water. Proper dosage is for topical administration. It should be processed with vinegar to weaken its toxins when taking orally. It is contraindicated to the pregnant women and valetudinarian, and antagonistic to Gan Cao.